The Maplewood Post Office closed on February 12th, 2015 and moved its operations to a new location. This was done in favor of building a new mixed-use development. More information can be found here. The brick, stone, and glass Maplewood Post Office was designed in 1958 by Maplewood architect Albert O. Pollitt. Its construction ended a half-century of commercial development in Maplewood. 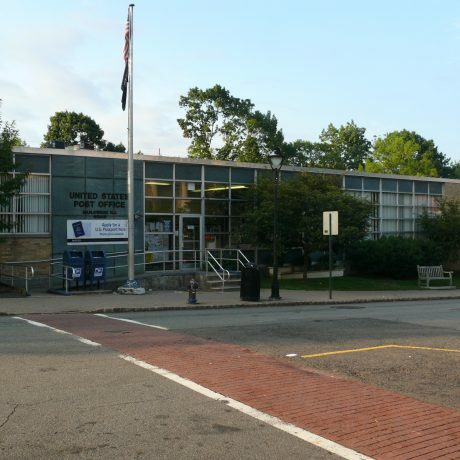 The Post Office, with its clean lines and lack of ornamentation, is a very good local example of mid-century modernism, also called, International, in post-war public buildings. Although it is intact, and an anchor in Maplewood’s lively downtown, the post office is under threat of demolition to clear the way for a large mixed-use building consisting of a supermarket and 25 apartments. The loss of this prominently located building in Maplewood’s central business district would damage its cohesive character and be a detriment to the community.